Sample Argentina’s rich culture and awe-inspiring natural wonders during this Argentina vacation package. From the vibrant cosmopolitan scenes of Buenos Aires and the striking natural beauty of the Iguazú Falls to the barren landscapes of Patagonia, the magic of Argentina will draw you in from the moment you set foot in this beautiful country. In Buenos Aires, tango houses delight and dazzle visitors nearly every night of the year. Watch as the whole city comes alive at night or entirely stops for a fútbol game. Straddling the Argentina-Brazil border, the world famous Iguazú Falls are nestled in one of the most beautiful parks in South America, which covers over 167,092 acres of jungle. Soak in the stunning scenery of Los Glaciers National Park’s snow-capped peaks and gigantic glistening glaciers from the pioneer town of El Calafate. The true gem of the park is the immense Perito Moreno Glacier, which towers over 60 meters above the water level. The region is also home to some of the most rugged and beautiful land in all of Argentina. You’ll end your Buenos Aires tour discovering tango at one of the most exclusive Buenos Aires tango houses, Tango Porteño. Enjoy a delicious gourmet dinner while musicians and professional tango dancers perform before you. Tango shows in Buenos Aires can be compared to broadway shows, with a live orchestra accompanied by professional tango dancers. Enjoy the rest of the day at your leisure relaxing at your hotel or exploring Puerto Iguazú on your own before your Iguazu Falls tour the next day. Discover Argentina’s most spectacular natural phenomenon on a full-day thrilling Iguazu Falls tour. You will drive to the Iguazu Falls National Park, where you will enjoy intimate views of the Iguazú River and the falls. The Iguazú Falls tour includes hikes along the Upper Circuit, taking you to elevated walkways leading to the edge of the major waterfalls comprising the system, and the Lower Circuit, a circular route allowing for incredible views from below of the waters crashing down. The tour includes a ride aboard the Ecological Jungle Train to the Devil’s Throat, one of the most impressive falls of the park, which you will be able to admire from spacious balconies along the edge of the falls. Transfer from your hotel to the airport and flight from Puerto Iguazú to El Calafate via Buenos Aires. 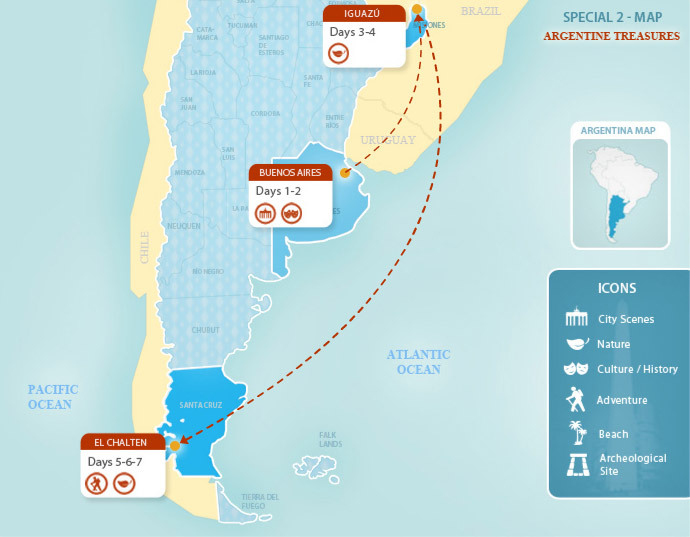 Transfer from your hotel to the airport and flight from El Calafate to Buenos Aires. Alternatively, check out our many exciting additional El Calafate tours to keep exploring this lovely area, or browse our full range of Argentina travel destinations for additional Argentina vacation ideas.